When Kate Moeves graduated high school, she went straight to college to become a pharmacist—just like her dad. But she was unhappy in her studies and realized her career choice was not going to be a good fit. “I just wanted to make people feel good,” she says. And she knew just the place to go where she could build a career in making clients happy—beauty school. More specifically, Moeves wanted to attend the Aveda Institute in Cincinnati. However, there was a one-and-a-half year waiting list to get in. Undeterred, Moeves put her name on the list and switched her college courses from pharmacy to business. She knew she wanted to be an owner someday, and that business courses would come in handy. What she didn’t know was how soon her dream of owning a salon would come true. When Moeves finally entered the Aveda Institute, she was the oldest in her class at age 21. She worked hard, graduated and made the decision to pursue a salon catering to a male clientele so she could hone her men’s cutting skills. The salon closing propelled Moeves into ownership sooner than she thought. She began looking for a building for her own business and in the interim, approached her previous salon’s biggest competitor. “I was very up front and told the owner I needed a spot to land for about nine months,” she says. Once she had armed herself with a strong male clientele, Moeves knew she wanted her business to be an Aveda Concept Salon. “I couldn’t wait to get back to working with Aveda products and color,” she says. The next step was finding space, which proved to be a major undertaking. “I got a loan and bought a run-down building that I completely renovated,” she says. “My parents helped me with the demo and I lived in the apartment above the building so I wouldn’t have to pay rent,” she says. Moeves saw something special in the 110-year-old building on a historic avenue of Bellevue, Kentucky (just outside of Cincinnati), and thought it was worth the effort of renovating. “I knew the area was starting to turn around and wanted to jump in early,” she says. So at age 25, Moeves opened 501 Salon & Spa. Sometimes, ignorance truly is bliss. Moeves confesses she had no idea what she had bitten off and what challenges she would face as a new owner—and she says that was a good thing. “I just worked in the business and on the business 24/7,” she says. “I didn’t do a ton of marketing at first, but I managed to get voted best new store in the tri-state area in a local publication in 2011, right after I opened,” she says. Hiring was tough at first because the salon had not built up a reputation yet. Moeves herself brought in a large male clientele, which she knew would fill the initial void. With no marketing budget to speak of, Moeves had to rely on her own savvy to continue to build her clientele. She created a Facebook page and got herself out into the community, which, as she predicted, was the perfect spot. 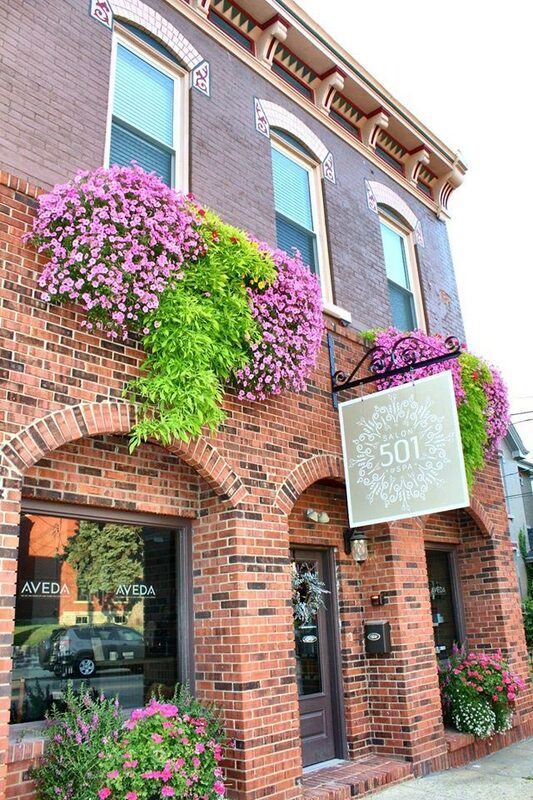 While there are multiple other Aveda salons in the area, Moeves says they’re each in their own distinct neighborhood. Scoping out neighborhoods has become a passion for Moeves, who loves renovating and helping turn communities around—she even married her contractor and the two flip houses as a side business. Recently, she found a building in an area just a few miles away from 501 that she couldn’t resist. The salon, which is in Newport, Kentucky, will have a younger, funkier vibe to fit the new neighborhood. Moeves has tied the two salons’ websites together, but she is focused on a fresh crowd. Getting the new business up and running has proven easier the second time around. Moeves has learned a lot and is using her knowledge for a smoother opening. She also has two stylists from 501 who are going to Industry and will help train and onboard new staff. She also advises working with someone you trust with your money to balance books and help with accounting—in her case, it was her mom. If your dream is to own, Moeves also recommends saving money and setting goals. Moeves herself already has dreams of a third salon, but she’ll renovate the original business first. “I’ll expand the spa, eventually tripling its size, before I open a third location,” she says.